Enrofloxacin, a second-generation fluoroquinolone, is commonly used in chickens because of its favorable pharmacokinetic (PK) profile and its excellent activity against gram-negative aerobic bacteria and some gram-positive bacteria [5, 6]. However, with the extensive use of enrofloxacin, resistance has emerged . Enrofloxacin is metabolized to ciprofloxacin, which is used clinically in humans, and there are reports showing that resistance genes for fluoroquinolones could transfer to other organisms under antimicrobial pressure [8, 9]. Thus, the non-rational usage of enrofloxacin runs the risk of leading to bacterial resistance and potential health hazards in humans [10, 11, 12]. Thus, there is a growing need to optimize the use of enrofloxacin. Optimizing the use of an antimicrobial should be based on a good understanding of its PK and pharmacodynamic (PD) relationship in target animals against specific bacterial species . 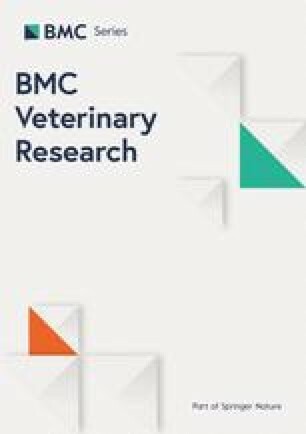 Although ex vivo PK/PD modeling of enrofloxacin has been evaluated in buffalo calves, swine, and chickens against E. coli, Pasteurella multocida, and Salmonella typhimurium [14, 15, 16, 17, 18, 19, 20], to the best of our knowledge, there are no in vivo PK/PD modeling studies of enrofloxacin against E. coli in chicks. In vivo PK/PD modeling has great advantages over ex vivo modeling in describing the PK/PD relationship , especially for enrofloxacin, whose metabolite, ciprofloxacin, (another fluoroquinolone) has almost the same potency as enrofloxacin. Therefore, for PK/PD modeling of enrofloxacin, it is important to involve its metabolism to ciprofloxacin in the modeling. According to our previous study, the selection of the target organ for PD determination is critical for parameter magnitude calculation in antimicrobial PK/PD modeling . Whether this is true for enrofloxacin requires further investigation. The PKs of enrofloxacin have been investigated in goats, pigs, calves, horses, and sheep [24, 25, 26, 27, 28]. It has also been studied in chickens [29, 30, 31]. The elimination half-life (T1/2β) values in this study (9.78–11.4 h) were similar to those in previous reports . After oral administration of 10 mg/kg of enrofloxacin, the AUC0–24 value (17.95 h) in this study was much lower than that reported in previously (35 h in Da Silva’s report and 25.35 in Mekala’s) [30, 32]. The difference illustrates that the pathological state affects the total amount of the drug in the blood. Although ciprofloxacin is the main active metabolite of enrofloxacin, few studies have reported the concentration of ciprofloxacin. Da Silva reported that the concentration of ciprofloxacin was lower than their limit of quantification (LOQ) (0.2 μg/mL) in healthy chickens . With an LOQ of 0.02 μg/mL, the concentration of ciprofloxacin in the present study was detected even after enrofloxacin administration at dose of 1 mg/kg b.w. 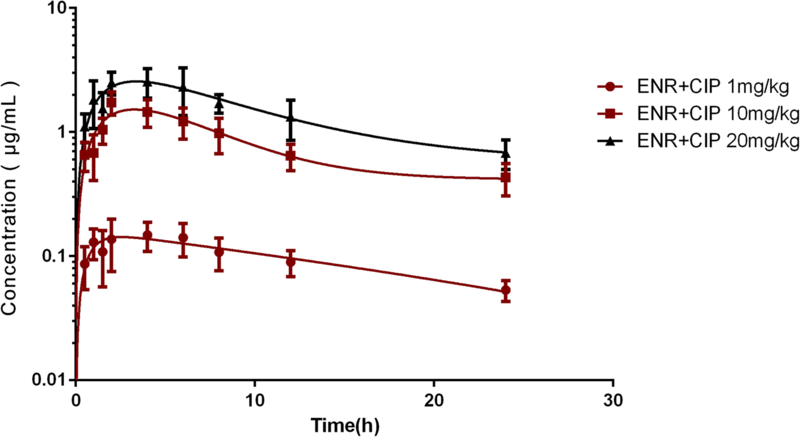 The biotransformation of enrofloxacin to ciprofloxacin at doses of 10 and 20 mg/kg b.w. were 7.9 and 15.3%, which was in accordance with a previous study . However, the biotransformation rate was as 37% higher for the low dose (1 mg/kg b.w.). The moderate concentration of ciprofloxacin indicated that the role of ciprofloxacin should be considered in pharmacodynamic studies of enrofloxacin. A good linear relationship between dosage and AUC0–24 was observed for enrofloxacin and ciprofloxacin. This phenomenon was similar to that reported in previous studies [21, 33]. To the best of our knowledge, there has been no in vivo PK/PD modeling study of enrofloxacin against E. coli in chicks. One of the best PK/PD parameter for fluoroquinolones is AUC0–24/MIC [34, 35, 36], and this study further confirmed this conclusion. Both the surrogate AUC0–24/MIC for enrofloxacin or the combination of enrofloxacin and ciprofloxacin correlated well with effectiveness in each organ. It seems that the metabolism of ciprofloxacin has little influence on the PK/PD modeling of enrofloxacin. However, whether the active metabolite plays a role in emerging resistance or has an impact on dosing optimization needs further investigation , because optimization of the dosing regimen involves not only maximizing therapeutic outcome, but also minimizing the risk of developing resistance [38, 39, 40]. The values of AUC0–24/MIC for the bactericidal effect were 19.3–32.15 in the different organs using only the concentration of enrofloxacin for simulation, and 21.29–41.68 when using the combined concentrations of enrofloxacin and ciprofloxacin for simulation. 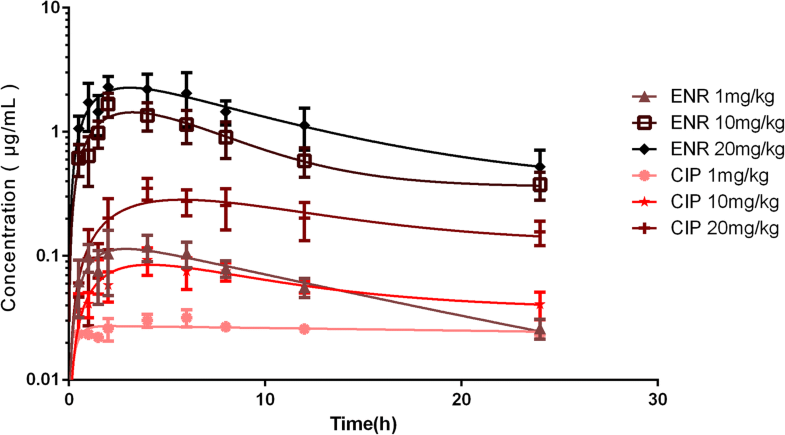 The values were much lower than those of enrofloxacin against E. coli or Salmonella typhimurium in the intestinal content of infected chicken calculated from ex vivo PK/PD modeling (1065.93 and 719.33, respectively) [14, 16]. Several reasons may explain this significant discrepancy. First, the components of the intestinal content are very complex, a large proportion of drugs may exist in a bound form and show no antimicrobial effect; however, in our PK/PD modeling, the whole amount of the drug was involved in the AUC0–24/MIC calculation; therefore, the value of AUC0–24/MIC in the intestines may be higher than that in serum to achieve the same effect. Second, as reported previously, the discrepancy between ex vivo PK/PD modeling and in vivo PK/PD modeling was obvious . Using the bacterial burden reduction in each organ as PD endpoints, the value of the PK/PD parameter, AUC0–24/MIC, to attain the same effect was different. The AUC0–24/MIC value for the bactericidal effect in the liver was higher than that in lung, and twice than that in blood. This phenomenon was also observed in our previous study. The AUC0–24/MIC values of danofloxacin against Salmonella typhimurium for the same effect in different organs also showed marked differences . Similar results were also reported in other studies [20, 41]. The possible reason for these differences may lie in the differences in the initial bacterial load, the concentration diversity of drugs in each organ, and the complicated structures among different organs. The precise explanation requires further study. Usually, bacterial load reduction in a single organ is used for PD evaluation in most in vivo PK/PD studies, and for ex vivo PK/PD studies, the antibacterial effect of drugs in serum or other body fluid is used for PD calculation [12, 40, 42, 43, 44, 45, 46, 47]. However, according to our results, for a systemic infection by bacteria, to describe the relationship of PK and PD exactly, bacterial loading reduction in different organs, as PD endpoints, should be compared in PK/PD modeling and the selection of a target organ for PD evaluation is critical in rational dosage recommendation.